Keratin is a revolutionary smoothing system that infuses Keratin (the protein that hair is comprised of ) deep into the hair cuticle, eliminating up to 95% of frizz and curl, leaving the hair smooth, shiny and luxurious. Results typically last 3-6 months depending on hair type. Clients rave that "this is a life-changing experience". Hair is more manageable, smoother and easier to style than ever before. Cuts styling and drying time up to 75%. Longing for smoother, straighter hair? Keratin hair-straightening treatments are a popular option at Studio B Hair Salon in Huntingdon Valley, PA.
What Is Keratin? It's a protein that's naturally in your hair. How It Works: Our stylist applies a keratin hair-straightening product to your hair and then uses the heat of a flat iron to seal it in. 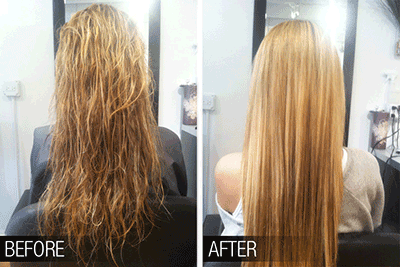 The process takes about 90 minutes or longer, depending on your hair's length. Check out the magnificent work of Nicole. Her long hair blow dry on Jenna McCormick rocked.